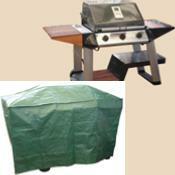 Keeps your barbecue clean and dry. The cover is made with non-rot thread from woven coated polyethylene, which has been UV stabilized for longer life. It has ties at the bottom for fastening.